Since planning meetings are harder to do in a small church, it’s even more important to make them matter. I’m a big believer in planning. But I’m not a fan of meetings. Yet planning requires meetings. So what’s the answer? We can do more effective planning by having more effective meetings. Patterns are good. Ruts are bad. Patterns give us structure. Ruts keep us stuck. Everyone who speaks in public develops speaking patterns. The danger is to not let those patterns become ruts. That’s why I purposely change the way I preach every few years. The title of today’s post comes from something I read on a friend’s Facebook timeline last week. The parentheses are mine. Before I explain why I used such a controversial comment as a blog post title, I’d like to expand on it. Fear of failure kills the innovative spirit. It's one of the main reasons many churches don't try new things. We're in love with the spectacular. Superhero movies, bigger buildings, viral videos and over-the-top personalities. It’s the same in a lot of our churches. We've become very noisy and personality-driven in our presentation of the gospel. For a lot of years, “I love Jesus, but not the church” or “the church may stink, but it's the only thing afloat” have been cool things for a lot of Christians to say. I used to be one of those people. Not anymore. Are you interested in church growth? Do you like Twitter? Then you'll love these. Even if you don't agree with all of them. Some principles about church size and church growth need an entire blog post to describe. Some require a book. Others can be said within the current 140-keystroke limit of Twitter. Like the following 15 truths. When it comes to small groups, what works for big churches may not work for small churches. 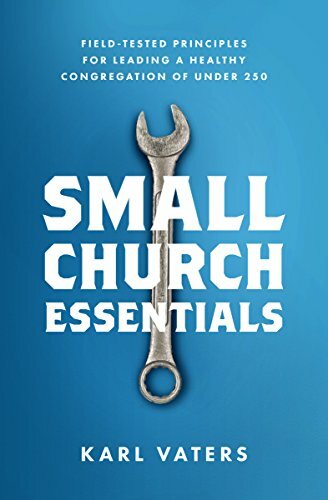 Small group ministry is a must for a healthy church. We need the fellowship, the accountability and so much more. But what if you can't get small groups going strong in your small church, no matter how hard you try? Maybe you should stop trying. For a while, anyway.